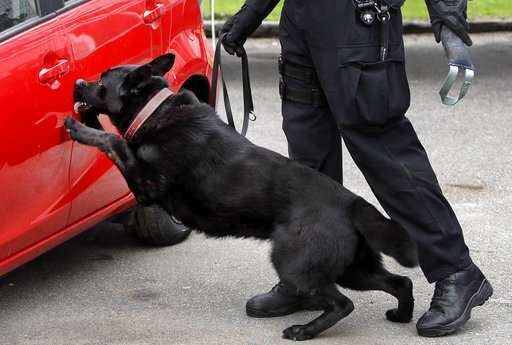 Police dogs simply follow their noses to sniff out narcotics. But inhaling powerful opioids can be deadly, so officers have a new tool to protect their four-legged partners: naloxone, a drug that has already been used for years to reverse overdoses in humans. 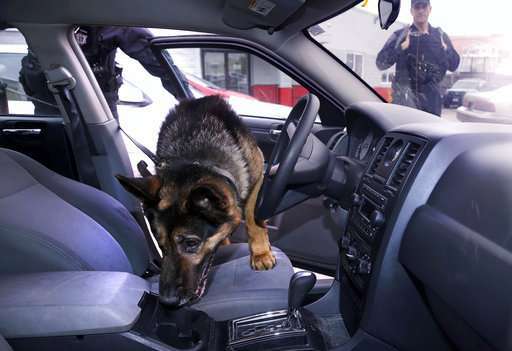 Law enforcement officers have started carrying naloxone with them on drug raids, when K-9s are often sent into houses or cars to find narcotics. Three police dogs in Florida were rushed to an animal hospital last year when they ingested fentanyl, a powerful painkiller that is often mixed with street heroin but 50 times more potent. Massachusetts State Police started carrying naloxone for their K-9s in March. Police in Hartford, Connecticut, started in January. Even just a small amount of powdered fentanyl can sicken police officers, so dogs are even more at risk, said Brian Foley, deputy chief in Hartford, where 11 members of a SWAT team were sent to a hospital after they were exposed to a mix of heroin and fentanyl during a raid in September. "Dogs are not looking for drugs with their eyes and feeling with their fingers; they're literally breathing it in and inhaling it," Foley said. "Our officers wanted it for their dogs' safety," he said. "They love their dogs like family and they want to protect them. They know they're putting them in the line of serious risk of overdose." The drug blocks the effects of opioids and reverses overdoses with few side effects. It has long been used by doctors and ambulance crews and more recently has been handed out to police, firefighters and even to people with addictions and their families. For both humans and dogs, naloxone can be administered through an injection or a nasal spray. 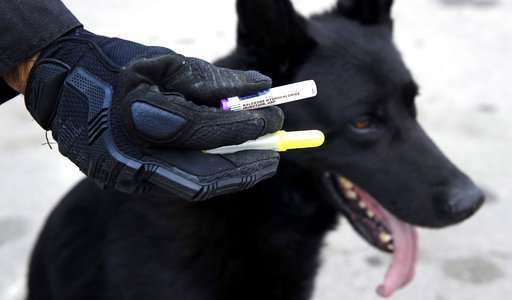 Some police departments carry the nasal spray for their K-9s, while others carry the injectable form. With a prescription from a veterinarian for specific police dogs, the Food and Drug Administration says, human naloxone can be used on them. Last year, the Drug Enforcement Administration released a video warning officers a very small amount of fentanyl ingested or absorbed through the skin can be lethal. In the video, Deputy Administrator Jack Riley urged police to avoid testing suspected fentanyl in the field and to instead take it to a lab. Riley also had a warning about police dogs. "Fentanyl can kill our canine companions and partners just as easy as it can humans, so please take precautions for their safety, too," he said. Andy Weiman, a detective who trains dogs for the Broward County, Florida, Sheriff's Office, said a German shorthaired pointer named Primus became listless after a search inside a suspected drug house in October. Primus and two other dogs were rushed to the vet. All three were given naloxone and recovered quickly. Weiman believes the dogs touched or inhaled a tiny amount of fentanyl—the same drug that killed the musician Prince—on a table or the floor. The drug can be absorbed through paws. "It's such a small amount that it would take to overdose the dog—like two or three granules of sand," he said. In Massachusetts, Trooper Stephen Barnes said he and his colleagues are trained not to deploy dogs where loose drugs are observed. "It's just become a more critical issue now because a much smaller amount of drugs can kill the dogs," he said. Symptoms of opioid exposure in dogs, as with humans, include sedation, pinpoint pupils, vomiting, stumbling and a slow respiratory rate, said Dr. Martha Smith-Blackmore, a veterinarian and adjunct professor at Tufts University. Just like people, dogs can require multiple doses of naloxone to reverse an overdose, Smith-Blackmore said. Deputy sheriffs in Greenville County, South Carolina, in February received training in how to administer nasal naloxone, sold under the brand name Narcan, to their dogs, said Sgt. Douglas Wannemacher, the K-9 supervisor and training coordinator. "It gives us a safety net," he said. "Our big thing is an ounce of prevention—preventing an incident for the civilians, the officers or the K-9s."